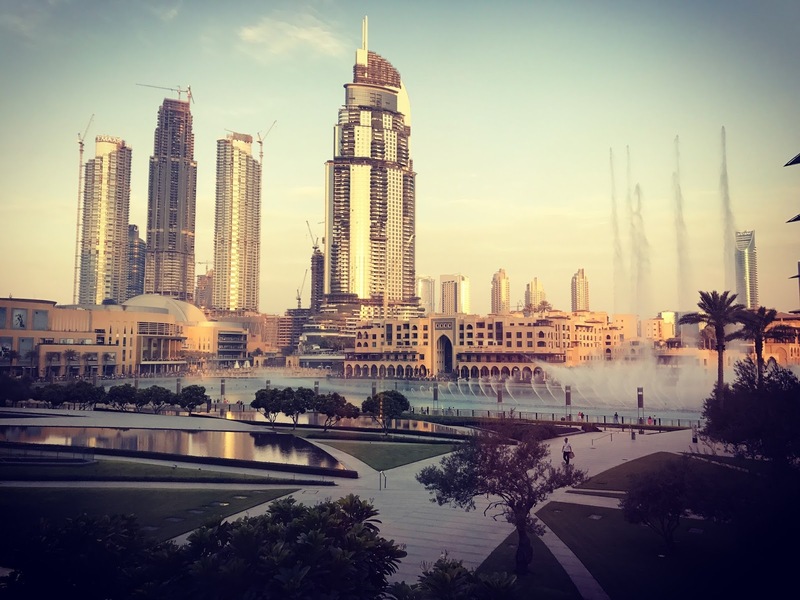 I loved writing my round up of July post-it was an excellent way to reflect on the month and reflect on how amazing living in Dubai really can be. I've decided to continue and I'm realising that what I thought was a pretty uneventful August was actually a pretty amazing one! So without further ado, here's my round up of an awesome August! I'm starting with the best thing I did this month-I went on another road trip. 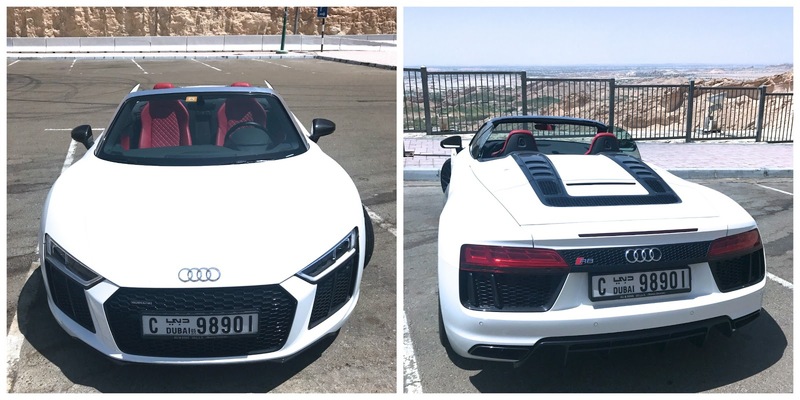 I loved going to Hatta last month but I decided to make this one just that little bit more special and hired an Audi R8 for the day as a surprise for my friend and we headed out to Jebel Hafeet which is about 2 hours drive from Dubai. 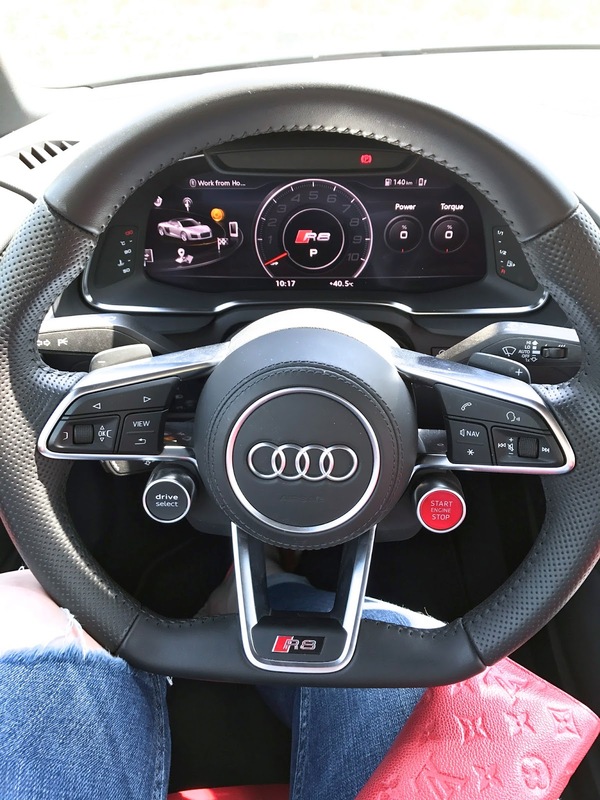 We had the most amazing day ever-what you may not know about me is that I have a motorsports background and I absolutely love driving. I've been to Jebel Hafeet many times but this was, without a doubt my very favourite time there. 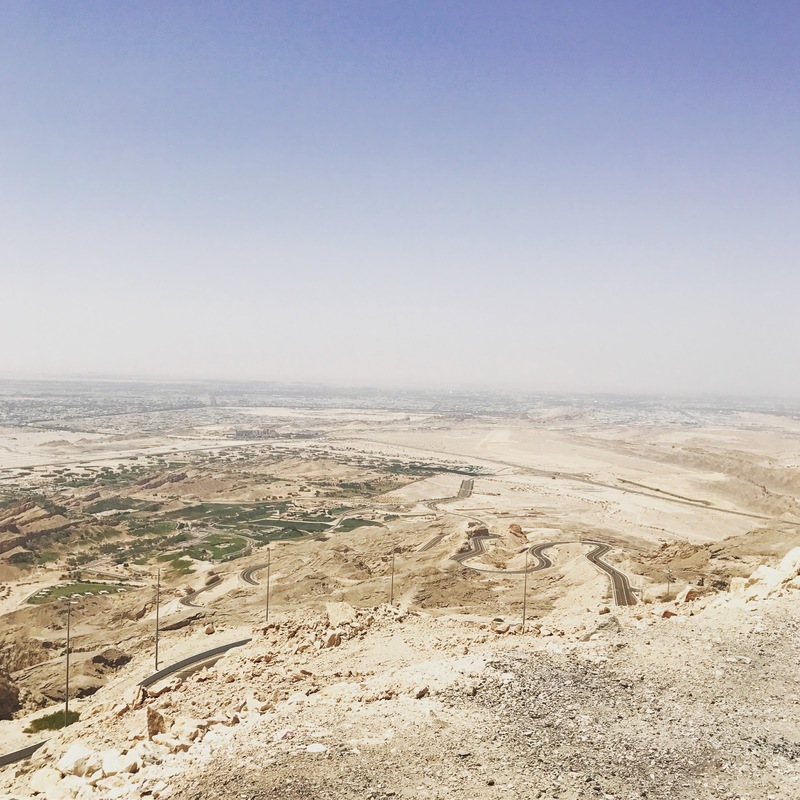 It was a beautiful day, albeit it's still in the 40-degree temperature range in the UAE but once we got to Jebel Hafeet we put the roof down, braved the heat and sped up the mountain. The feeling of the wind in my hair and the roar of the engine was something I will never forget. And check out the vistas. Jebel Hafeet stands at almost 1300 metres with panoramic views across the UAE and over to Oman. The car is AMAZING. 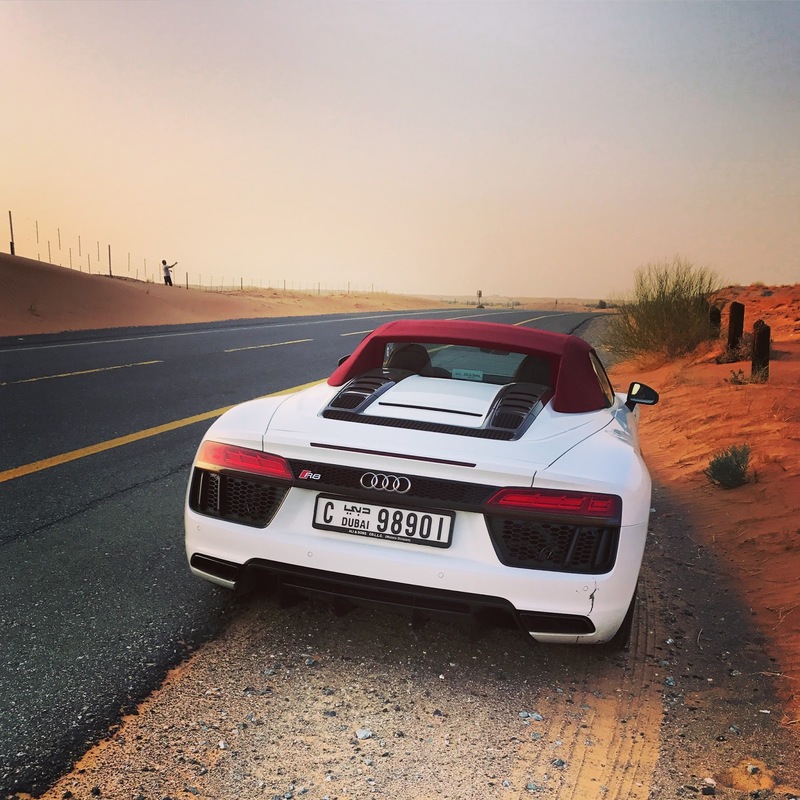 The R8 wasn't my dream car-it was my friends. But it's mine now too, I absolutely loved every second driving it. I'm a really good driver as well-I did the 11.7km mountain road (which as you can see twists and turns like a snake all the way up) in 7.09. I want to go again so badly-it was my favourite day of the year so far. I didn't eat out as much as in July but I had some pretty good dinners. The first highlight is dinner at Gaucho in DIFC. I have so much love for Gaucho, I could go there every night of the week. They serve my favourite dessert in Dubai-the Dulce De Leche cheesecake which comes with hot salted caramel sauce and toasted marshmallow. I cannot wait for my next visit and I would highly recommend a visit. Danny and his team will definitely ensure you have an awesome night. I also went for the business lunch at Zuma. It's very dangerous working where I work because there are so many amazing restaurants on my doorstep-Gaucho and Zuma are literally 20 steps from my office, my office is positioned between La Petite Maison and Cipriani and I am literally spoiled for choice. This was actually my first time at Zuma which has won award after award for its food. 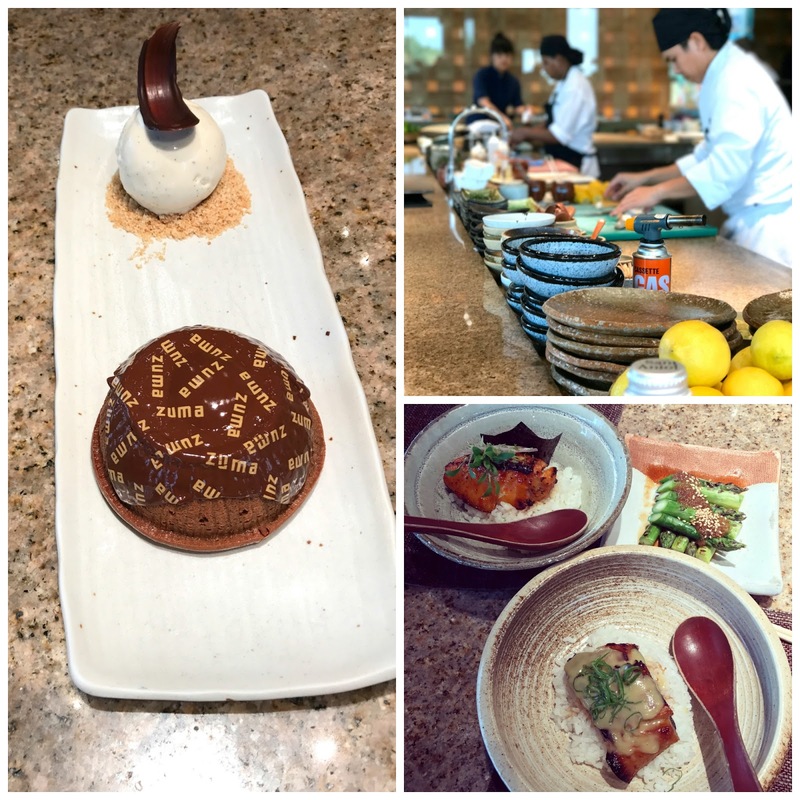 They do an excellent business lunch with a really good variety of dishes. You can choose two starters and a main and then add a dessert for a reduced price. I had the gyoza and the beef sashimi to start and black cod for my main. 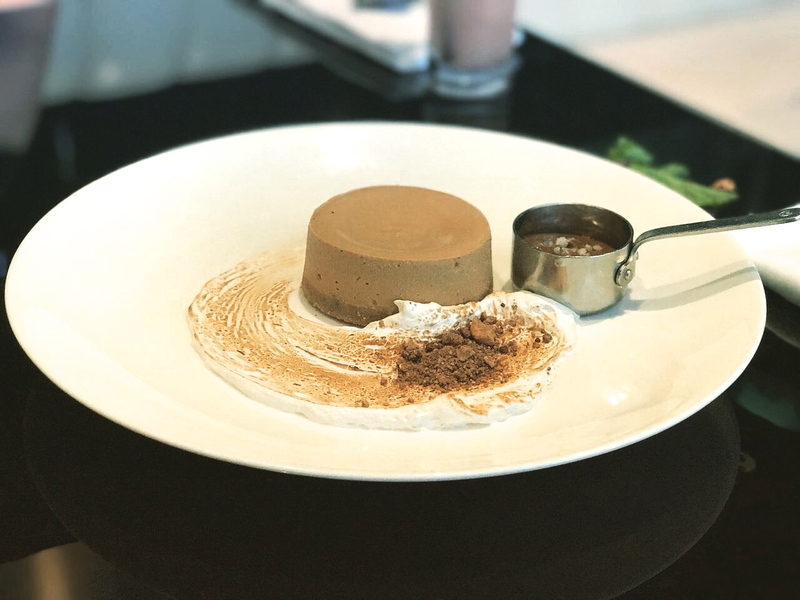 Chloe and I then shared the signature Zuma chocolate dessert but I could have easily eaten one to myself, it was amazing! Highly highly recommended but this place is packed every day for lunch and dinner so book ahead if you want to go! Ok so if you know me at all you know I love a fancy dining experience but I also love a Shake Shack as well! You know those places that you always go to with the same person and sit at the same table and have an amazing time? Well, that's Shake Shack for me. Hence why, after long days in the office we went twice in August! My tip? 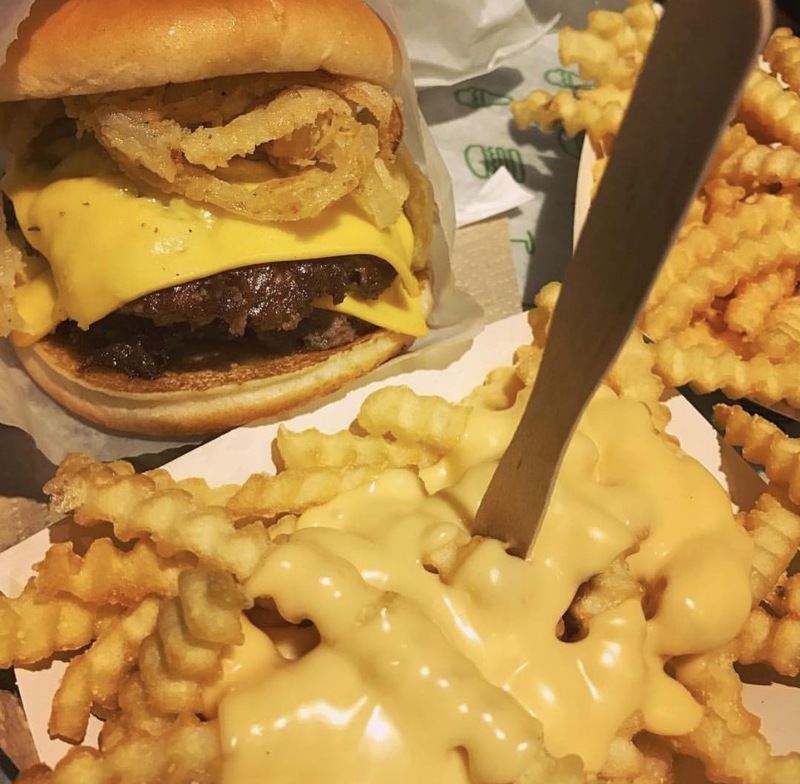 Always get the cheese fries! 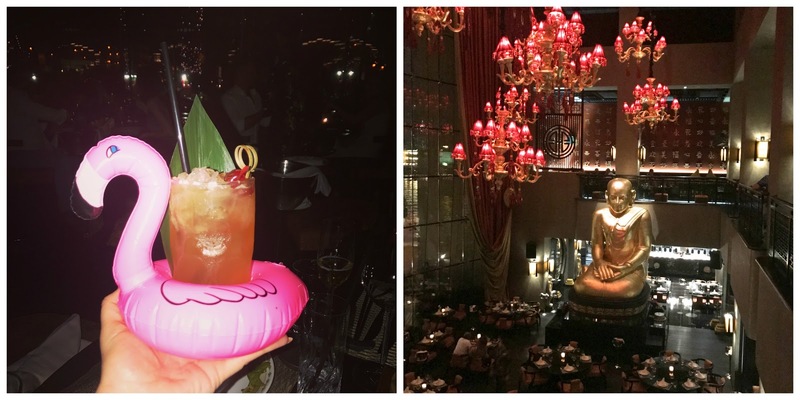 Another recently rediscovered favourite of mine, I went for dinner at Buddha Bar where the food is consistently good and the cocktails are epic. I mean who doesn't love an inflatable flamingo? The food is Pan Asian and it's best to go on a Wed/Thurs or Friday night but you'll need to book-I could only get a 10 pm table on a Thursday night. But we left at 3 am so we got our money's worth. I definitely recommend checking out the bar upstairs-it's quite small and intimate but has a really nice vibe and excellent service. I think we were the last to leave! 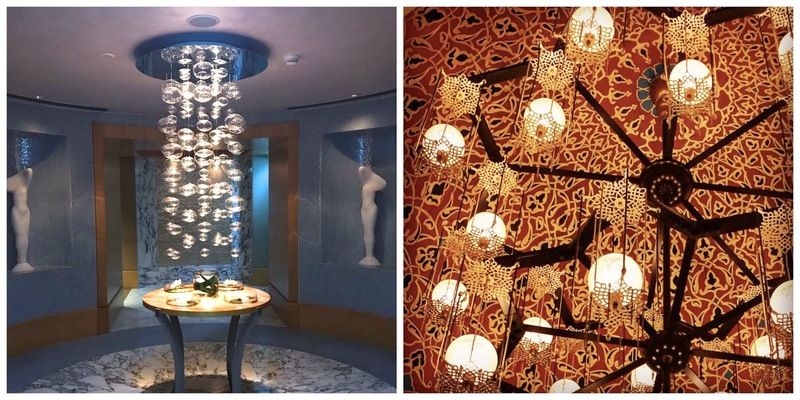 I was lucky enough to spend time at 4 spas in Dubai in August-The Talise spa at the Burj Al Arab, The Talise Ottoman spa at The Jumeirah Zabeel Saray, the Armani spa and The Ritz Carlton spa at the Ritz Carlton DIFC. They all cost around the same and I had a 90-minute massage at all of them. It's worth noting if you want to book a spa treatment in Dubai that although many places offer a 'couples' massage, there is a gender policy in the hotels where a female therapist treats female guests and a male therapist will treat male guests. What this also means is that a lot of spas have separate facilities for men and women-different saunas, pools, steam rooms and relaxation areas. 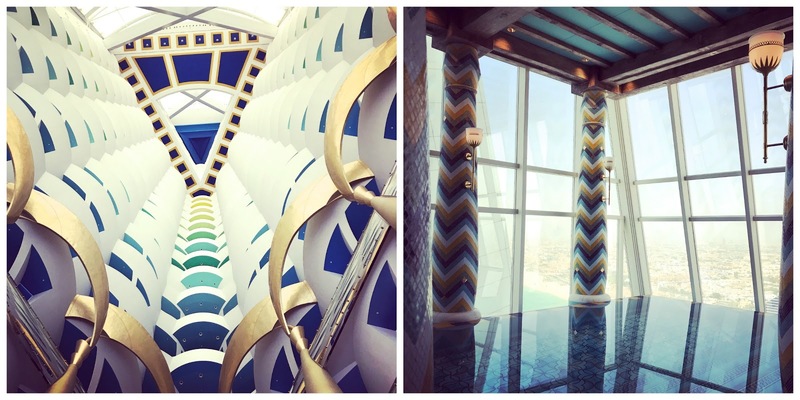 The Burj Al Arab, as you would expect, is opulent. It's rich blues, emeralds and golds everywhere and the treatment rooms were absolutely beautiful with views across the Marina and JLT for the ladies spa and across Downtown Dubai in the male spa. The massage I had here was nice but it wasn't mindblowing in all honesty. 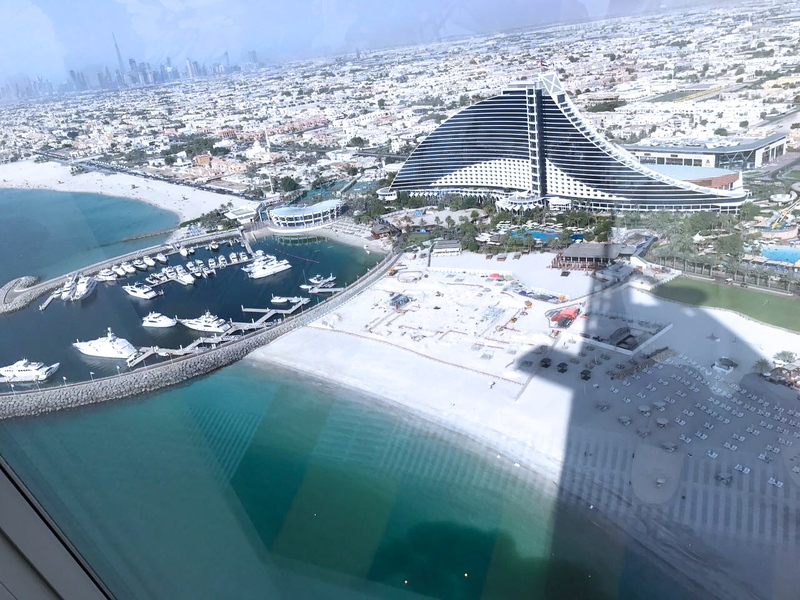 I loved the indoor infinity pool (available for men and women) and the views over the Jumeirah Beach Hotel are always breathtaking. We both agreed the massage at the Armani spa was the best, hands down. We combined the massage with a scrub and honestly, my skin has never ever ever felt as soft as when I rinsed it off in the shower. The spa was very cool and contemporary as you would expect from Armani, there are no mixed facilities apart from the pool but as the pool was outdoors we didn't use it in the searing August heat. Armani does not have a jacuzzi either. The massage I had was incredible. I wasn't offered a choice of oil although my friend was. I also wasn't asked about the pressure I wanted but Alice, my therapist nailed it. I felt like I was walking on air afterwards. 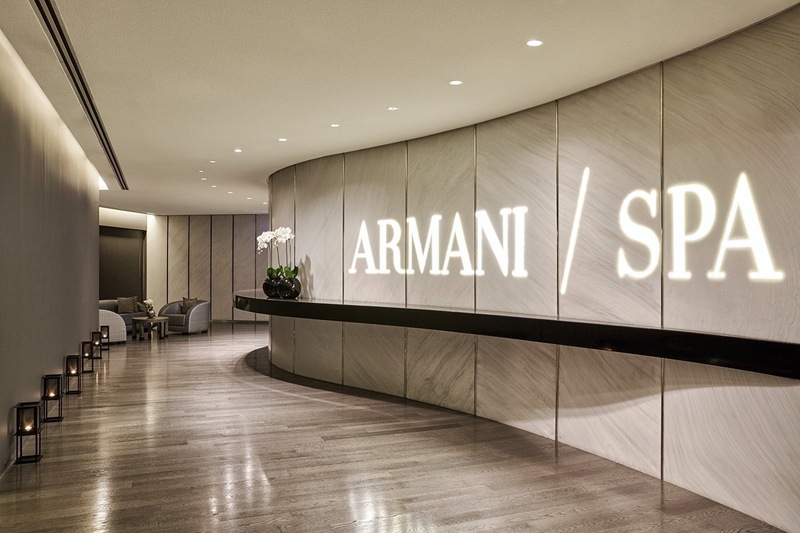 This is a spa I will definitely return to in the cooler months so I can enjoy the pool-it's worth noting that if you have the Entertainer spa book/app then Armani is included in there. We had dinner at Armani Deli afterwards which has amazing views of the Dubai fountains. They serve mainly Meditteranean/Italian food and do an amazing Burrata salad. We also went to the spa at the Ritz Carlton in DIFC and here the staff were the most friendly and helpful. I was advised what type of massage to have and combined it again with a body scrub and I was given a choice of 3 oils depending on how I wanted to feel after the treatment-I chose the invigorating one given I was going out for dinner afterwards. The scrub here wasn't as nice as Armani-it felt much drier on the skin on application but my skin was soft afterwards. The therapist was very attentive and offered advice and frequently checked everything was ok. I was also given Natura Bissé skincare samples to take away. Given this one is right on my doorstep I would definitely go again. The final spa was the Talise Ottoman spa in the Jumeirah Zabeel Saray. This was, without doubt, the largest spa with the most facilities but unfortunately, because we were running 5/10 minutes late I felt that I had the worst experience here. The treatment was at 7 pm and we arrived at 7.05pm. Ideally we would have got there earlier but unfortunately, workload meant that wasn't possible. I was rushed to the changing room and into the treatment room and even though I was the last client of the day, because we started at 7.10pm the therapist knocked 10 minutes off the 90 minutes I had paid for. We both had a hot stone massage for 90 minutes (or 80 in my case) but my friend said that the stones used on them were not as hot as they would have liked and the treatment room was really cold even though the therapist turned off the air conditioning. I wasn't given a tour of any of the facilities-after the massage I was shown to the female relaxation area and I asked for a peppermint tea but they were out of stock. My friend was shown round though and saw the Hamman and the 'snow rooms'-I'm so disappointed I didn't. This is, without doubt, the most beautiful spa and it's beautifully decorated with a Turkish theme-I just wish I had seen more of it. It's worth noting that Kirsty went there this weekend for the couples treatment and absolutely loved it-she put an Instagram post up about her experience and if she blogs about it I will link it into this post. Nothing! I've had a few spendy months and there just wasn't a real desire to buy something. Prices in Dubai are so expensive compared to the UK and although I do love an online splurge I also really enjoyed actual shopping in London and France. 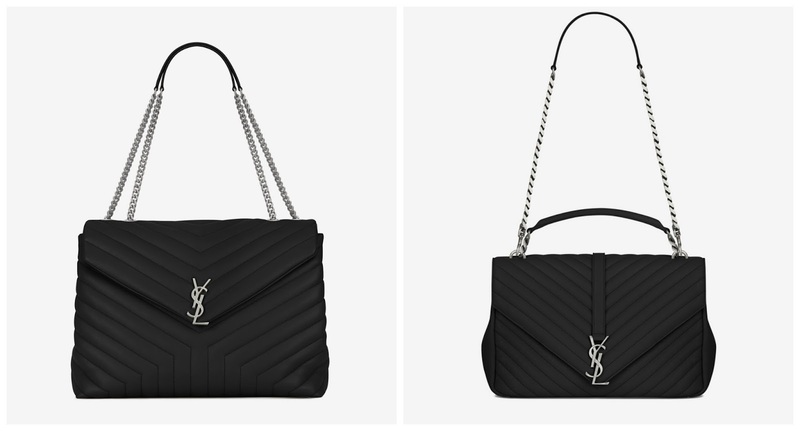 However I have two things on my wishlist currently that are seriously tempting me-the first is a larger YSL bag. I've narrowed it down to the large Lulu or the large College-but I think I am leaning towards the Lulu (the bag on the left). I want to go and look at them instore but it's likely I will buy from London in December. 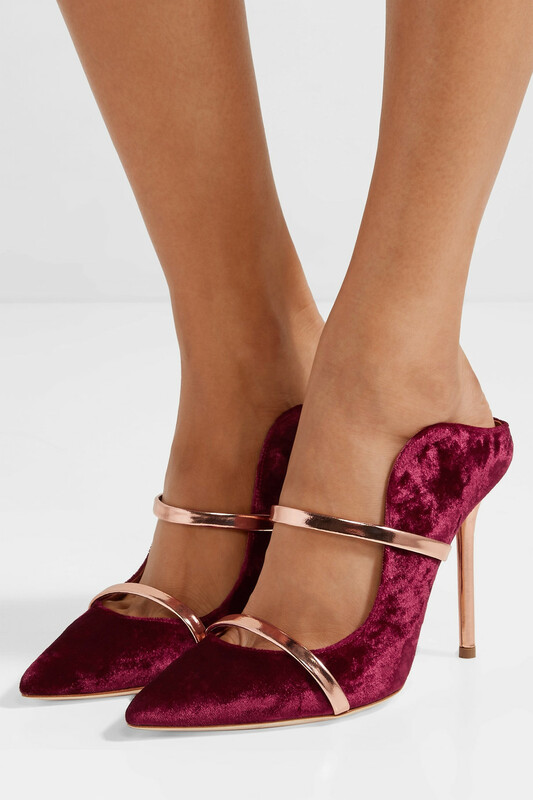 The second item on my radar is a pair of Malone Soulier 'Maureen' heels-I love the look of these burgundy velvet and gold ones-they seem so perfect for Autumn and Winter. I need to try them on to see if they look too weird on me but I think they're stunning. If you have tried these I would love to know if they're comfortable? The do sell Malone Soulier here so I can try them on in the Mall and then order from Net a Porter. I just need someone to tell me to buy them lol! 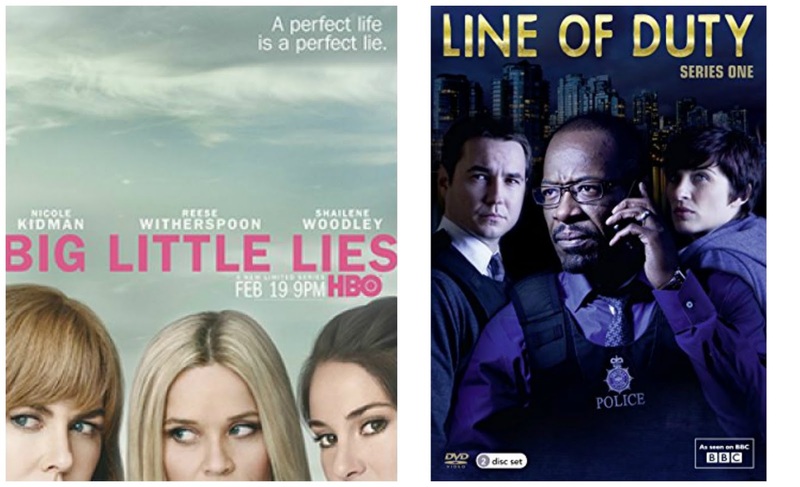 Not sure how I had time for TV but I binge watched 'Big Little Lies' which was epic and has an amazing soundtrack-it was very gripping and I devoured it over a weekend after discovering it on a flight home from Cairo. I also started watching Line Of Duty on Netflix and am now season 3-I love crime drama the most so this is right up my street even if I am late to the party! I hated my skin and it hated me right back! I got a horrendous hormonal breakout that took ages to clear but I found 4 products really helped. 1) Lancome Hydrazen moisturisor-I know this doesn't irriate my skin and it's lovely and soothing 2) Using the Marc Jacobs coconut face primer-again I know it doesn't irritate so it's a safe bet 3) (pictured) The Skinceuticals Phyto Corrective which is a very watery serum-I apply 3-5 drops a night to my fingertips and press over my chin and 4) (pictured) Dr Sebagh Supreme Maintenance Youth Serum which I use in the morning which is helping to fade the scars left from those horrible spots. August was pretty awesome and September is going to be incredible. Stay tuned to my instastories because I have so much planned and some special visitors from the UK. It's going to be epic.